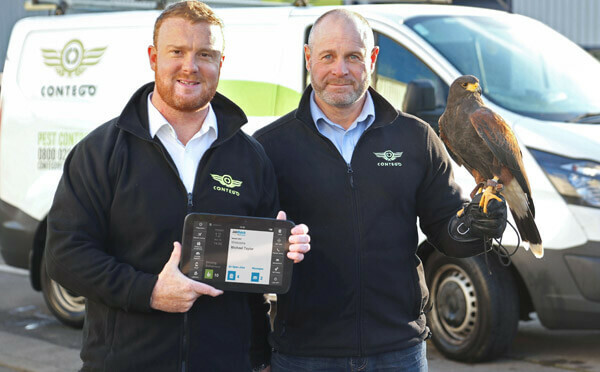 Leeds, UK, 19th February 2019 – Contego, the nationwide pest control company, has turned to the latest smart mobile technology to underpin ambitious business expansion within the UK. The 5 in 1 system from BigChange has transformed Contego’s business, replacing existing systems and eliminating paperwork. Called JobWatch, the solution has replaced over 100 paper forms with a series of simple apps running on mobile devices used by the company’s field technicians. Contego is one of the UK’s largest independent pest control companies and a respected leader within the industry; recently shortlisted for British Pest Management Awards Company of the Year. The Durham-headquartered firm operates a four hour fast-response service 365 days a year and the BigChange system is seen as an essential element to support planned expansion in 2019 and beyond. Established in 2004, Contego has always been an industry innovator and had implemented earlier generation mobile systems and vehicle tracking. The company’s specialist Falconry Response services utilises specially trained falcons and hawks deployed to control bird pests. The system handles everything from the initial service request through to completion. This includes job scheduling, live tracking, completion of risk assessment and other compliance related forms including vehicle safety checks, treatment forms, signature capture, invoicing and full management reports.